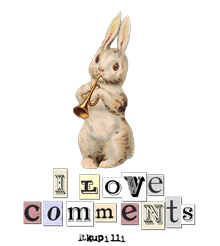 This entry was posted on March 15, 2019, 09:00 and is filed under Arts and Crafts, Pets & Problems. You can follow any responses to this entry through RSS 2.0. You can skip to the end and leave a response. Pinging is currently not allowed. You have been busy! Flo looks less happy – but is that just because she doesn’t like having her photo taken, or is she still mourning the loss of her other blanket? 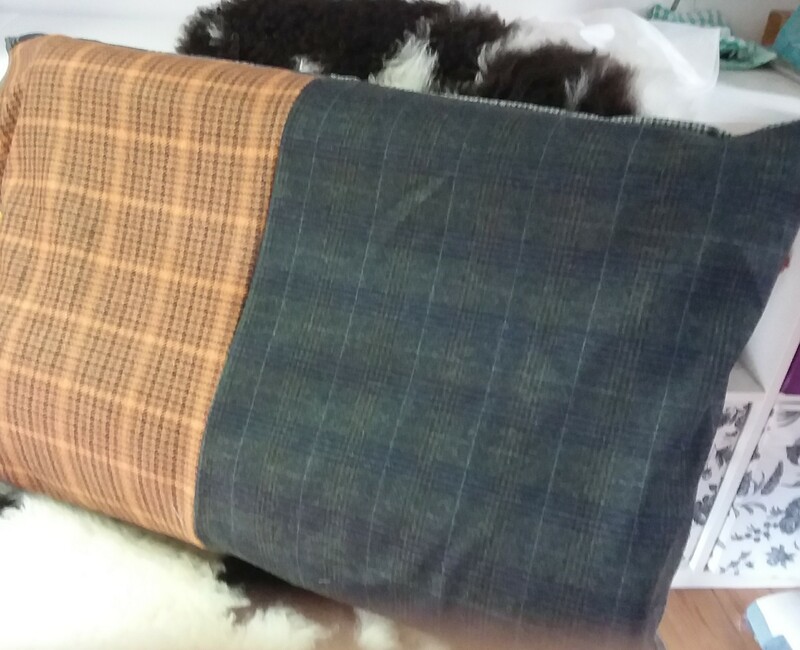 that’s a great use of the upholstery fabric, and looks very chic as a dog mattress! I think they find that pillow a bit more comfortable than I did. I must say, Flo did look a bit reluctant initially, but I bet it’s comfier than her old blankie, even if it doesn’t smell right yet. Stan loves it and now gets in the bed in preference to one of the comfy leather chairs – which is a good thing – but the cats have also discovered it so he has to wait in line. 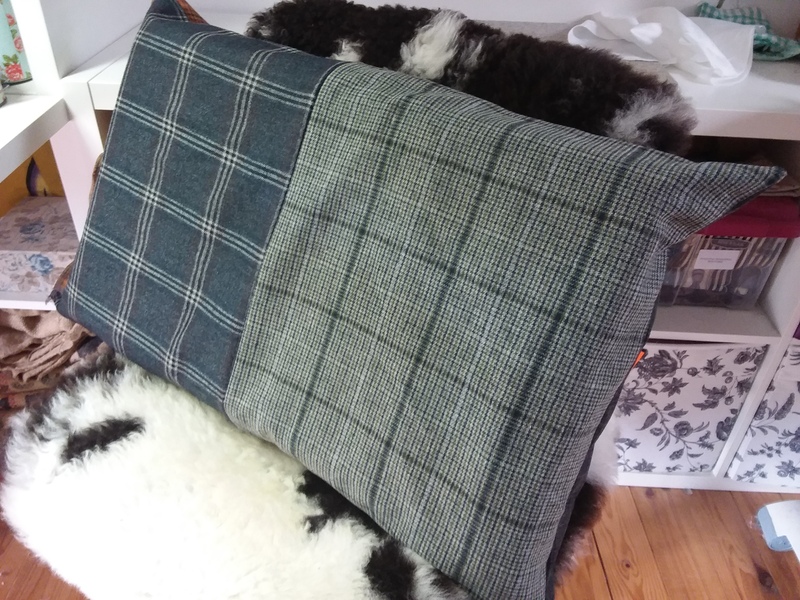 Maybe I should buy a job lot of orthopedic pillows and make lots of these to spare my sofas and chairs – but then they would ignore them in that special way animals (especially cats) find to be annoying. Or indeed Husbands, who seem to have an overwhelming need to steal your one favourite pillow from the six on the bed…. It’s a rather adult and sophisticated bed covering they have now, almost Downton Abbeyesque in its tweedy elegance! I do like a good excuse to put ‘esque’ on the back of a word though and I see you feel the same. Good work! I’m sure it’ll soon become the best seat in the house and every pet will be vying for it. I need to approach Scrap Happy the way you do–as a monthly commitment. I just post if I’ve happened to make something with scraps and I guess I hardly ever do. I’ll aim to do better next month! It definitely focuses me in the same way as if I start a project, I like to think my readers expect me to finish it so it encourages me to do so even though I don’t suppose anybody really cares. Oh, good grief! It’s just one short step from those ‘cats and dogs playing poker’ pictures. But also strangely compelling: what dog do YOU look like? I wanted to put the image itself in my reply but I guess you have to be a paying customer to do that. Ha ha! Great link. Of course you don’t need to ask what dog I think I look like. Well, if you will insist on both going to the same hairdresser 🤣 I am also one for the ‘tousled’ look, which is difficult as my hair wants to be straight, but I couldn’t compare myself to a Goldie as they are so kind and gentle and soft and I’m, well not really any of those things. Tee hee – haven’t got to Harry yet, but I used to trim Hicks and I have been know to borrow his scissors for my fringe, so you’re not so far off the mark. Think you’re rather doing yourself down there. 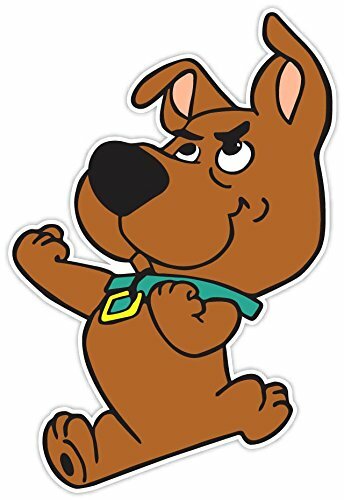 Scrappy Dapppy DOOOOOOOOOOOOOOOOOOOOOOOOOO!! Nice bed. 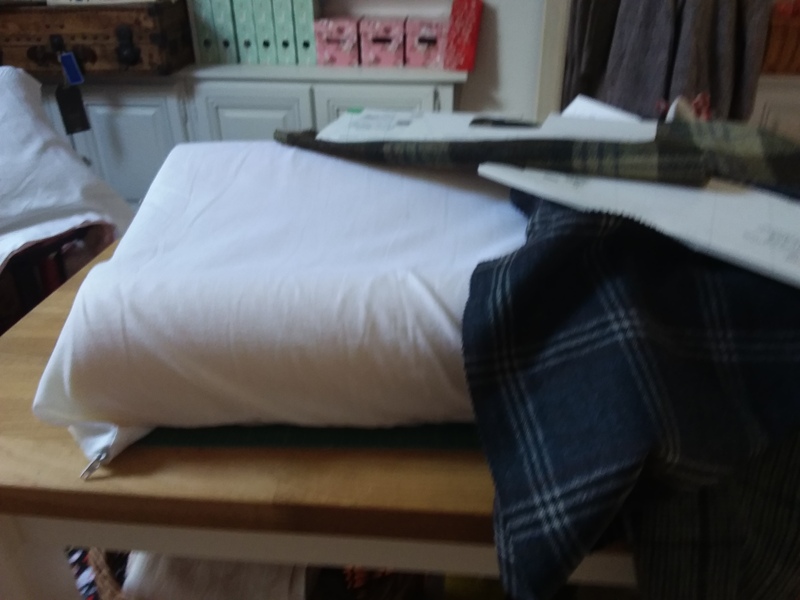 Great idea to use an orthopaedic pillow – stikes me though that you’re in danger of turning into one of those people who send off/goes into shops just to get samples of material to make into other stuff. Or are you already that sort of person? No, that’s not me. A friend knew somebody who had bought a local textile factory and was clearing it out to convert into offices. To be honest, I was hoping for more yardage and less samplage but, hey it’s all car seat fabric round here so I don’t know why I was hopeful. Once I said I’d go and have a look I couldn’t very well say ‘no, I was actually looking for something better for free’ could I? Ah. I see. I did wonder why you had car seat fabric samples. Brilliant use of scraps and an uncomfortable pillow. Dogs are always sad when you take an old blankie away, but sometimes it’s necessary. 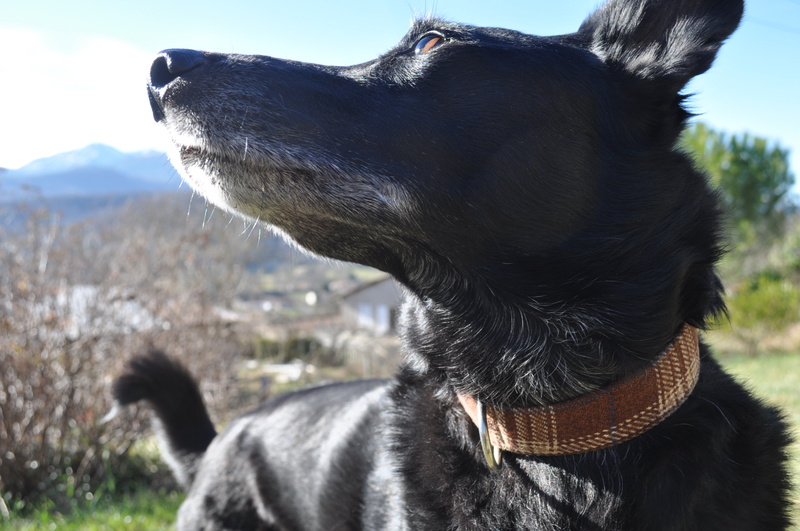 I had big plans for scraphappy this month, but multiple vets visits got in the way and so I have nothing to show, although, like you I do try to use it as a focus to enthuse me about scrappy projects. Great use of scraps and the pillow that you couldn’t use! That pillow was, ironically, a pain in the neck and I’m glad to find another use for it. 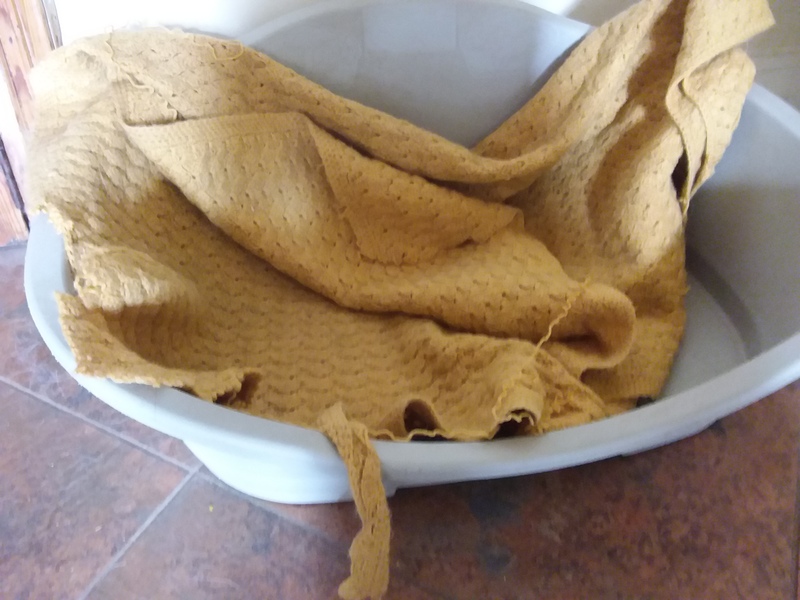 That is an extremely smart dog bed and top notch use of scraps. It’s well posh ain’t it? 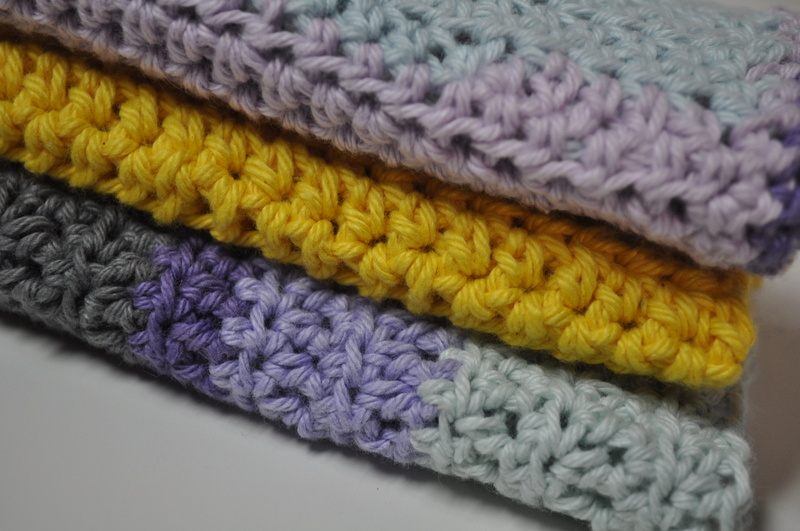 It’s the simplest of the simplest stitch – Uk double aka US single crochet – all the better to mindlessly churn these out while indulging in some telly watching in the evening. I just chain about 40 with a 3.5mm hook and some cotton dk yarn (worsted?) and off I go until it’s the ‘right’ size. Thank you, Lynn! And yes, I think DK=worsted. . . . . Nope. According to Crochet magazine DK is something termed “light worsted” and uses 4.5 to 5.5 mm, whilst worsted uses 5.5 to 6.5mm. But that’s all very loosey-goosey as far as I’m concerned as one also should consider how loosely or tightly one crochets. 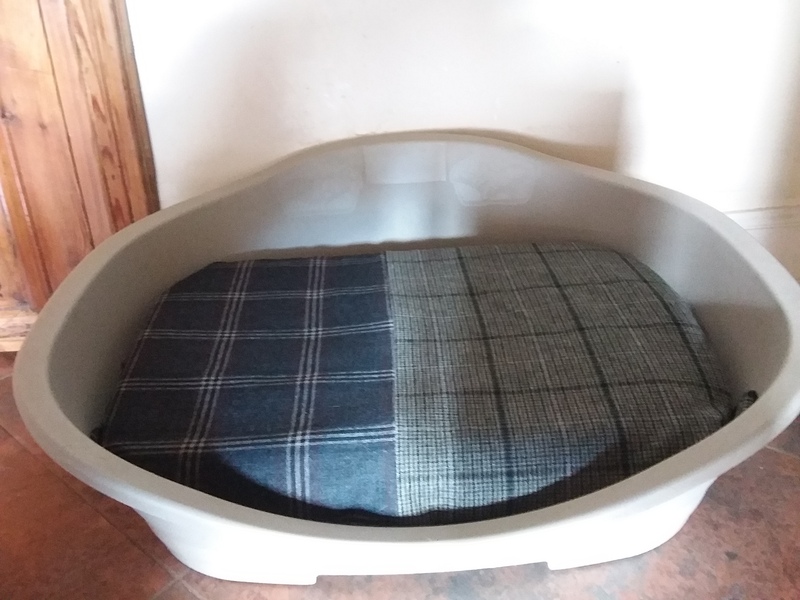 Great looking dog bed with the new pillow! We splurged last year and bought Max a proper bed…a Sealy posturpedic no less, and he ignored it for a good three months, but now he sleeps in it all the time, and in all different ways! Dogs are so funny that way. It sounds like yours are coming around quickly! Ours is pretty plain but with his loooong spine and short legs (and a good sale) we decided it was worth the $40! The cover is washable, which is what sold me! Oh, well, that’s not bad. The ones I was looking at were well over 100 euros – although they were a large size. The Sealy beds appear to have to be ordered from the States so, of course, the shipping makes them very expensive but there’s a make in Europe (forget the name now) which look like the same thing and have almost complete 5 star ratings from people so, when their other bed wears out, I’ll probably invest. Flo and Stan have such sweet faces. I’m glad to hear that your work was only temporarily snubbed, and that the pups and felines are now lining up to take turns. 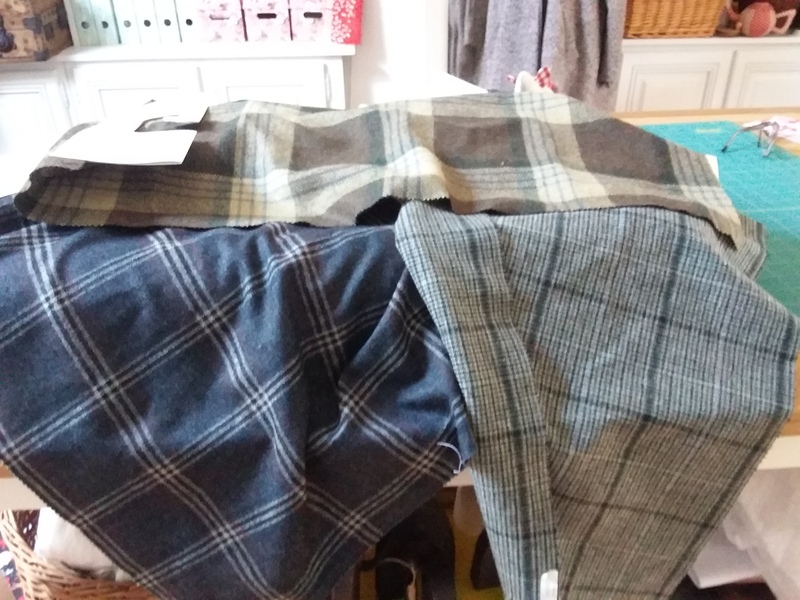 I must have missed the post about the car fabric samples, but how perfect for a dog bed. 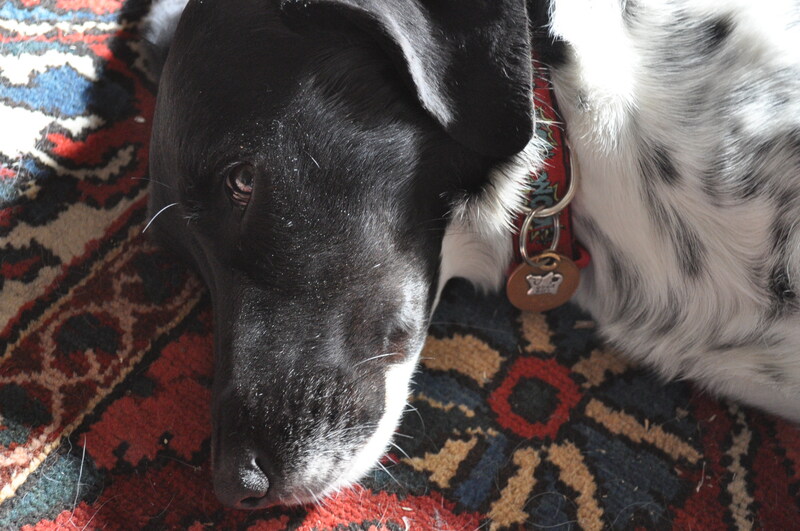 I like Stan’s collar, too. These scrappy posts are a lot of fun. I look forward to participating and I have fun seeing what everyone else is up to. Anything that encourages using up some scraps must be a good thing mustn’t it? I probably wouldn’t do it so often if I didn’t want to have something to contribute to the Scraphappy posts. Agreed! And here we are just two weeks away from the next one. 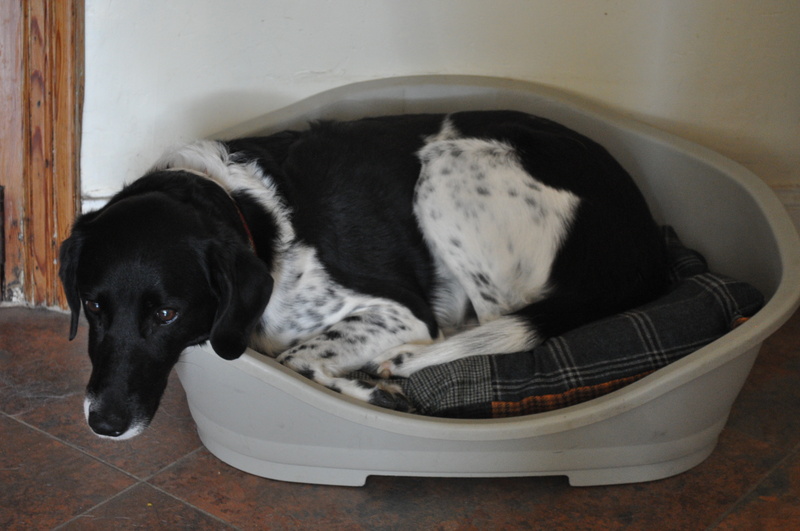 What an exceedingly smart dog bed! It’s already looking a bit hairy – but the hoover will sort that out (eventually). Mirrhi has a miserable face on her a lot too, I ask her what she has to be unhappy about but she just sighs and looks away. Perhaps she wants a fancy ortho pillow with a swanky handmade cover. Your Flo is very lucky, it’s a great use of unwanted / exra items. It’ll be smelling skanky in no time and she’ll love it.